Carnival Cruise Line recently unveiled their newest cruise ship, the magnificent Carnival Horizon. We are very excited about cruising on this ship and you should be as well. Carnival Horizon brings bigger fun, better dining options, luxurious and modern living, shopping and industry-first features. The beautifully designed vessel weighs a whopping 133,500 gross tons and carries 3,960 guests. Carnival Horizon also has 1,450 friendly international crew onboard so you never have to worry about not being given enough attention. Cruising in a new ship is always super fun, everything is new and state of the art. Especially when cruising with big cruise lines such as Carnival. The Carnival cruise ship has combined modern art with traditional Cuban decor to create the perfect atmosphere for a vacation. A giant LED sculpture displaying colorful graphics greets you as you step into the guest lounge on board the ship. What’s even more inspiring about this is that the central atrium sculpture features artwork from the children of St. Judes hospital. 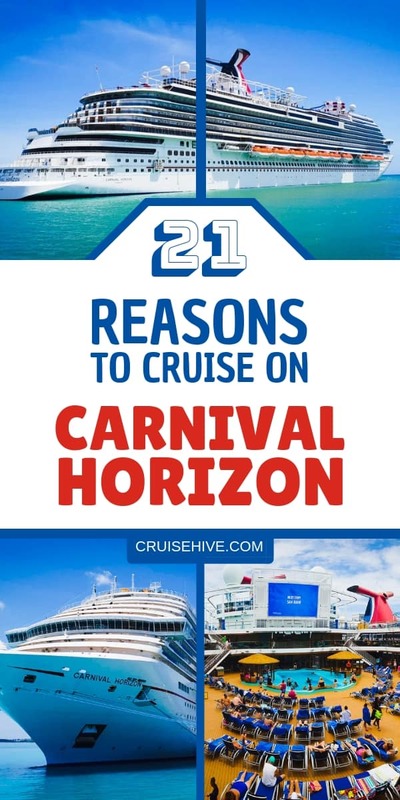 The Carnival cruise ship which is the sister ship to Carnival Vista will not disappoint with plenty of offerings onboard for the entire family. There are even brand new venues not featured on other ships in the fleet. Technology plays a central role in making sure Carnival Horizon is leading the way with the popular Carnival Hub App and new ways for checking in and getting to the fun faster! Spacious is not a word we use when describing cruise ship cabins. Fortunately, we now can. Starting with the famous Havana staterooms that adorn elegant decors combined with Cuban inspired designs. Making these rooms resemble island resorts. Get all your cruise cabin accessories from Amazon by going here. The best thing about booking a Havana stateroom is the all exclusive access to the Havana bar and pool area. Your own paradise of solitude by day and a party venue by night. You won’t resist the charm of the place. It features an infinity pool complete with thatched palapas around the pool near the bar. Just be ready to part with some extra dollars. 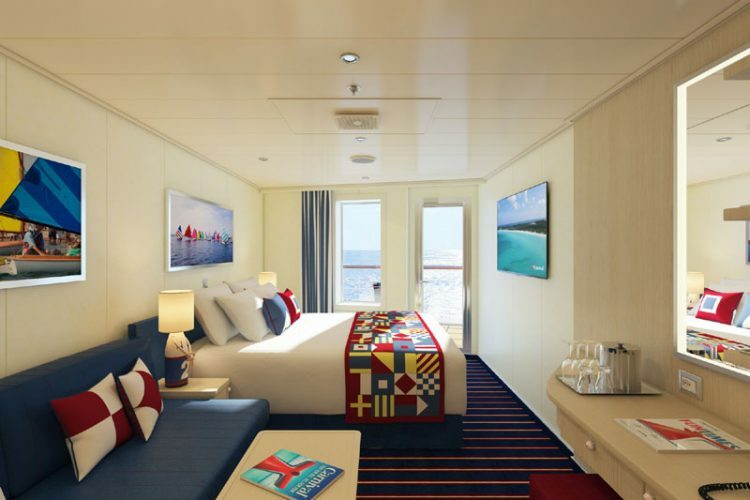 However, if you are cruising on a budget you can still enjoy the comfort of the ship in the interior rooms, which are also beautifully designed. Pro tip: Book a stateroom with ocean views, it’s larger than an interior room. It also gives you an advantageous view of the ocean and its stunning environs. Carnival Horizon’s itinerary indicates the cruise will be visiting tropical destinations. A stateroom with a balcony will come in handy when cruising to these destinations. The cool sea breeze will be a welcomed change after spending the day in the Caribbean heat. Wouldn’t it be nice to spend your mornings in bathrobes on the balcony taking breakfast and enjoying the beautiful sceneries? Before your cruise buy your Carnival inspired cruise luggage tags. 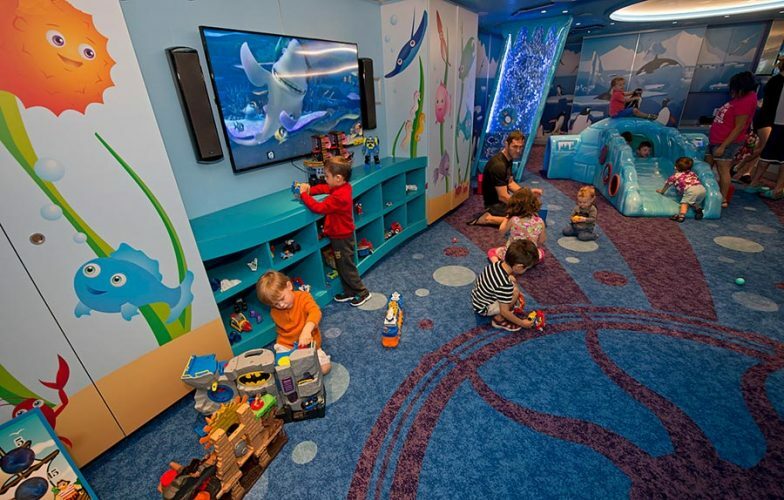 Carnival Horizon also boasts of being one of the most family-friendly ships at sea, with all the latest additions of Dr. Seuss’s whimsical fun areas. It’s nice to know that the fun extends to the stateroom as well. Enjoy the Family Harbor Staterooms & Suites which feature a gorgeous nautical décor. Besides that, they also have an exclusive lounge filled with family-friendly amenities. Catch a movie with your family, play games, have your kids eat free at specialty restaurants and enjoy concierge services. Another reason to cruise with this ship is the Havana Pool and bar area. The Havana area is an oasis of blissful island-like relaxation by day and a Cuban inspired dancing scene at night. While this venue and pool are only available for Havana stateroom guests, you can also enjoy it at night when it’s free for all. One of the places that will become your absolute favorite on this ship, is the serenity adult only area. If you can’t join the guests at the Havana, you won’t be at a loss in the serenity area. This paradise of tranquility is the perfect place to lounge and catch some rays. You can read a book, hang out with your partner or simply enjoy the stunning views and peace of the place. Still, on relaxation visit Cloud 9 Spa and fitness club. You will discover the true meaning of relaxation. A vacation would not be a vacation if you couldn’t relax. As such, immerse yourself into the spa world and enjoy the full range of spa treats that come along such as massages, facials, body wraps and others. 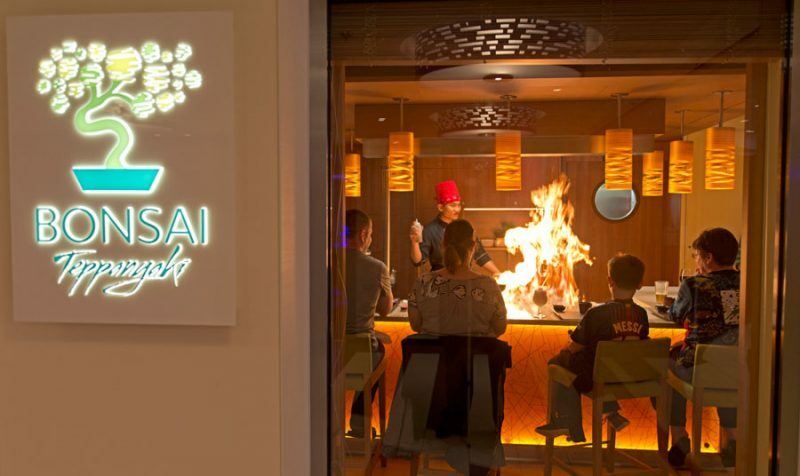 Carnival Horizon has retained all your favorite eateries such as JiJi’s Asian kitchen, the chef’s table, Bonsai Sushi, Guy’s Burger Joint, Cucina del Capitano and the Blue Iguana Cantina. But new venues have also been added, including Bonsai Teppanyaki where you will watch the blade works as the chef prepares your food right before your eyes. Enjoy such dishes as fish, shrimp, lobster, and meat with delicious accompaniments in this wonderful interactive dining experience. Other specialty venues that you shouldn’t miss include Sea Shack, Fahrenheit555 Steakhouse, and the main dining rooms. 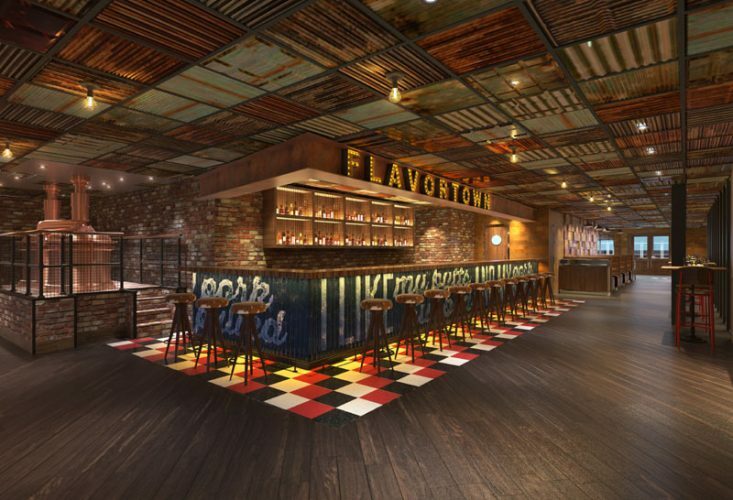 Among the new restaurants added on Carnival Horizon include famous celebrity chef Guy Fieri’s Guy’s Pig & Anchor Bar-B-Que Smokehouse|Brewhouse. You can now enjoy smoked brisket, ribs, and chicken such as you have at home. But better, because the menu at this place is created by the barbeque wall of Famer chef-Guy Fieri himself. To top it all up, you will get to enjoy these tasty delights for free every sea day. At Guy’s Pig and Anchor not only will you enjoy the best barbeque at sea but also enjoy Carnival made craft brews with your meal. Enjoy a hoppy IPA, smoked porter, a toasted amber and a farmhouse ale at Parched Pig craft brews right next to your table at Guy’s Pig and Anchor. The brew is supervised by a pro brewmaster and you can also take a tour of the brewhouse. All this while enjoying some tunes in the Texas-themed restaurant from live music performances. 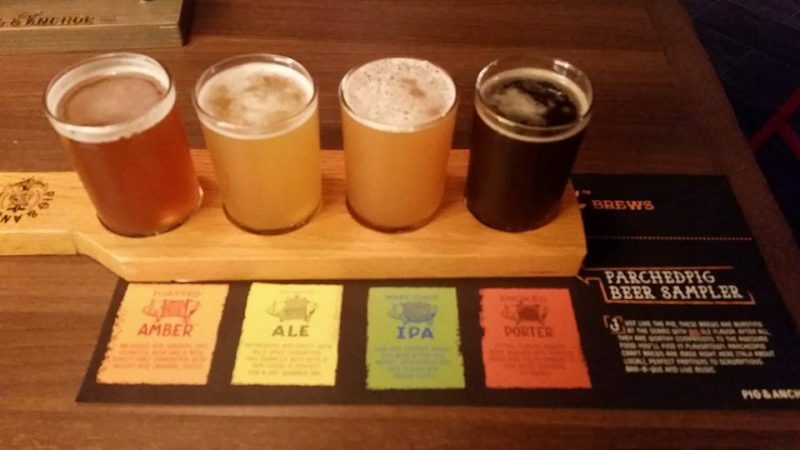 You can actually read more about the exclusive beers just for Carnival Horizon right here. As if great dining venues, better living and lots of fun things weren’t enough then Carnival went and added an IMAX to its list of features. In fact, Carnival has two movie theatres known as the Multiplex whereby one theatre is the IMAX showing the latest movies in all its grandeur and the other right next door is a Thrill theatre with 3D visuals and amazing performances that employ motion effects. There is always something you want to try out but don’t know how and where to begin. Well, Carnival Horizon gives you a chance to cross off Lip Sync Battle from your bucket list. Join the competition in the stage version of the hit paramount network series. If you turn out to be the real superstar then they will even throw in help in terms of choreography, lights, props and even backup dancers for your final performance. There was an epic Lip Sync Battle held onboard Carnival Horizon during her naming ceremony in New York. The event included godmother Queen Latifah. Don’t be surprised to find yourself getting groovy in the theatre lounge. Enjoy songs that you know brought to you in a whole new way in playlist productions. Enjoy the performance from an amazing cast as they turn popular hits into different life experiences. Each night has a different set of playlists. A cruise vacation just isn’t the same without any water fun for the entire family to enjoy. 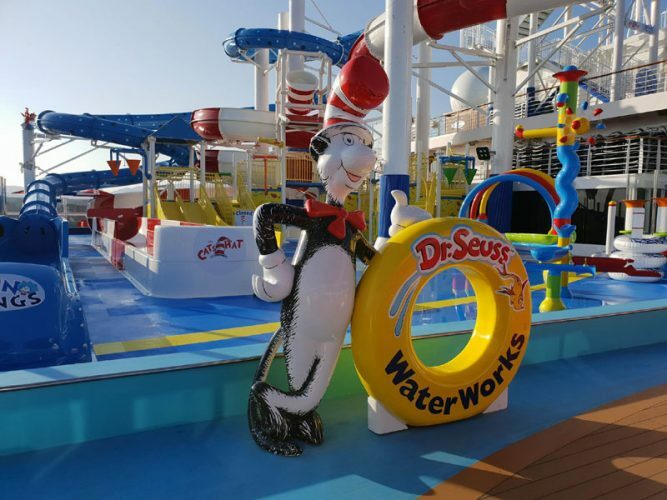 Carnival knows this and that’s why there is the first Dr. Seuss water park in the fleet on Carnival Horizon. Enjoy sliding hundreds of feet down through the twisting and turning curves in the twister slides or enjoy the same as strange lights dance on your body in the fun slide. Let your inner child out as you join your kids under the 150-gallon tipping water bucket. Also, have some fun with the waterfall like experience when the bucket pours its contents on you. The greatest attraction on Carnival Horizon just as with sister ship Carnival Vista is the Sky Ride. Go cycling hundreds of feet above on this ride and at the very top deck. You will get to enjoy the thrill of racing your buddy while taking in the great views of the sea and the vessel below. But if you are more daring then try the sky course. A rope course suspended hundreds of feet above ground, that gives you similar thrills to the sky ride but with an added challenge. Laughter during a cruise sounds like a great idea. And you will enjoy lots of it at the Punch liner comedy club as the pros belt out rib cracking jokes that might leave you gasping for air. Best of all, no drinks minimum or the ridiculous cover charges usually charged on land. 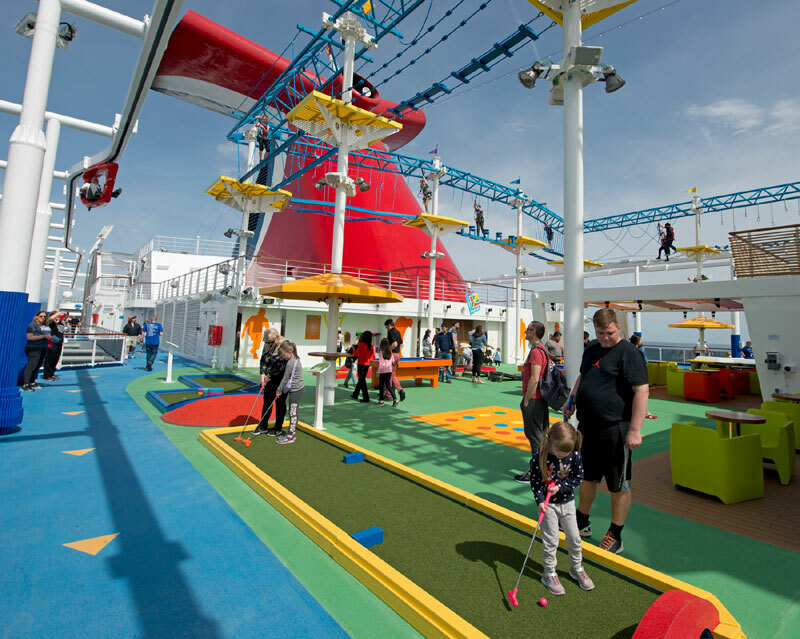 Another reason to cruise with Carnival Horizon is that it’s a kid-friendly ship. They didn’t forget the little ones on this magnificent ship. The Camp Ocean provides a play area and hangout zone for kids under the age of 11 years. You can leave your young ones here while you take an evening out with your partner. They will have a blast, watching movies, singing, dancing, creating art and playing. There are professional counselors that watch the kids on your behalf. That’s not all, your teenagers have a place to hang out too at Club O2. Here they get to interact with their agemates, play video games, chat and do whatever teenagers do for fun on a cruise. Circle C is a gaming area that will keep all your kids happy and engaged, as they play and compete against one another. It features a variety of gaming stations, labs for experiments and other fun things for kids to do. Play giant versions of Yahtzee and connect 4 in the Hasbro game show. Bring your gaming skills to this live audience game show and compete against other family or groups for a reward. Burn some calories or get competitive at the sports square. You won’t miss your play of choice on this ship. There are indoor games at the clubhouse including pool and mini bowling. Guests can step outside and challenge buddies in a game of basketball, volleyball, mini golf or ping pong. A cruise vacation would not be complete without including those lovable frozen fruity concoctions, that bring that aah feeling. 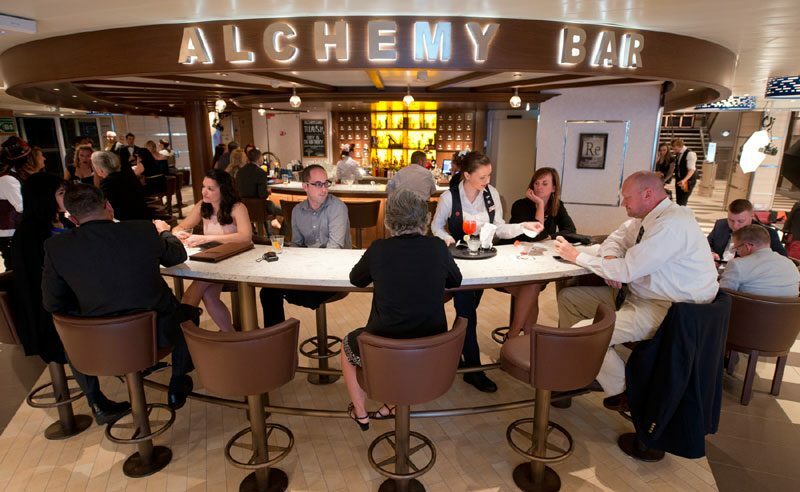 The Alchemy Bar on Carnival Horizon promises to bring new flavors to the table, with recently discovered ingredients and combinations. Visit the bar for the best cocktails at sea. If for nothing else go for the views. Enjoy al fresco dining along the lanai promenade with great views of the sea and its surroundings. Catch the cool breeze as you stare into the endless skies and water for a moment of respite and reflection. Read a book or catch up with a partner. 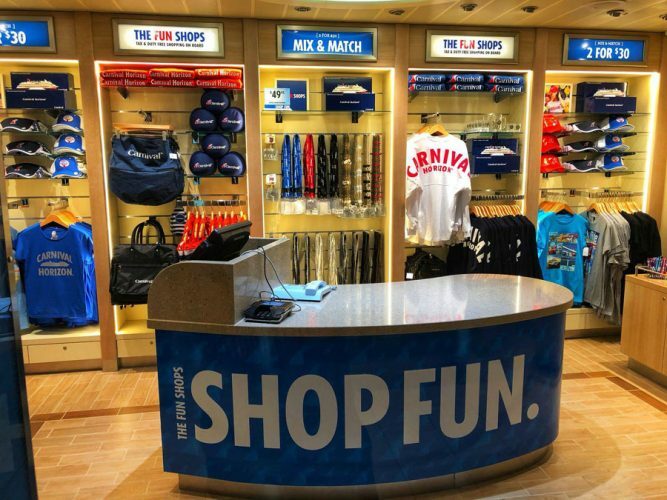 Carnival Horizon brings in a vast shopping area featuring shops such as the fleet first Victoria’s Secret along with LeVian and Kate Spade, Michael Kors, Breitling, and Hublot. The shopping area on this ship is conveniently located around the main atrium on deck 4 and 5. The two-story shopping plaza features top-line retail brands and many shops that sell everything from jewelry, perfume, liqueur, and clothes all at Tax and Duty-Free of course but do note that the stores are only open when the ship is in international waters. While on the topic of shopping you can actually get all your Carnival Cruise Line inspired items from Amazon by clicking here. That’s not all that can be expected from a cruise with Carnival Horizon. You can try some dance classes, go to the casino, catch all your favorite games at the Skybox sports bar or you can visit Cherry on Top for all your candies and ice-cream delights. The Library Bar is another venue you can check out, it offers wine dispensers and a huge collection of books. With all these, you should be as excited as we are about the second Vista class Carnival cruise ship. The ship’s itinerary includes short voyages of 4-day to 5-day from New York to Bermuda during summer. The ship will also sail longer 6-day to 8-day cruises to the Caribbean from its Miami, Florida homeport starting in September 2018. We hope you are now as excited to try out Carnival Horizon as we are. Have fun on your next cruise! !